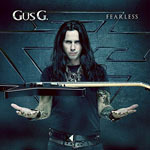 Share the post "Album review: GUS G – Fearless"
Gus G will always be quizzed about his tenure with Ozzy’s touring band and the return of Zakk Wylde. But, in the grand scheme of things, the Ozzy episode will eventually assume more normal proportions on a CV that started back in the late-1990s when he marshalled the band that would become Firewind. Fortunately the Ozzy diversion has not prevented Gus touring (and recording) with his original band and he’s also released a steady stream of solo albums since 2014 of which ‘Fearless’ is the latest. Something has been made of the three instrumentals (the title track and the frenetic ‘Thrill Of The Chase’ plus an additional piece on the digpak version) as a response to fan demand for unalloyed guitar excursions but, overall, it’s business very much as usual. Playing in what is essentially a power (metal) trio format Gus has enlisted producer/vocalist/bassist Dennis Ward (producer of Firewind’s current album ‘Immortals’) and the two also share songwriting credits. Opening track ‘Letting Go’ and early single sets the pace and sounds familiar, as ever a vehicle for Gus G’s engaging guitar solos and fluent shredding closely followed by the heavy riffage of ‘Mr Manson’ and repeated on ‘Don’t Tread On Me’. The mid-tempo ‘Nothing To Say’ is the album’s standout ballad that he does so well, with ‘Last Of My Kind’ running a close second. The inclusion of ‘Money For Nothing’ is the album’s curveball and is a fairly straight cover albeit Mark Knopfler would be somewhat startled and shaken by the guitar fireworks on display. As with the recent Firewind album there is a feeling throughout that Gus G is not really breaking any new ground with his solos or power metal stylings which are nevertheless very well done. When he deviates slightly from the template – as on the straight ahead rock groove of ‘Big City’ – the results are impressive and a breath of fresh air.